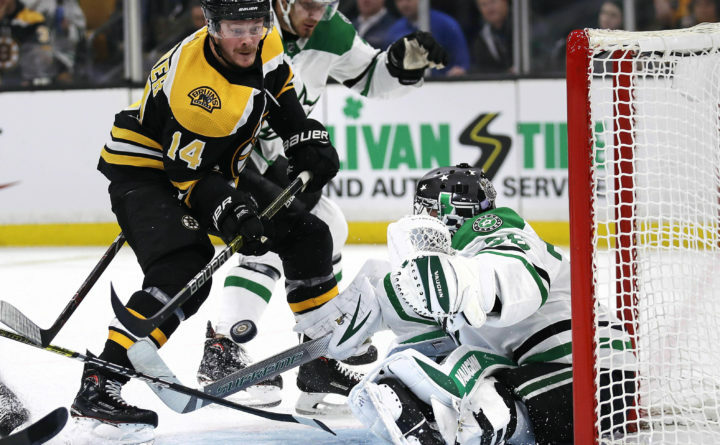 Dallas Stars goaltender Anton Khudobin, right, makes a save on a shot by Boston Bruins right wing Chris Wagner, left, during the second period of a hockey game in Boston on Monday. BOSTON — Brad Marchand had very little room and not much time. “It was a little weird because I never ever played against the Bruins in TD Garden,” said Khudobin, who played for Boston in parts of the years 2012-13 and 2016-18. “It wasn’t our best game, but we gave our team a chance to win on the road,” Faksa said. With the World Series trophy won by the Boston Red Sox in the building before the game, “Dirty Water” was played briefly over the sound system after Marchand’s walk-off winner — a song played after victories at Fenway Park. It was his franchise-best 13th career OT goal. Boston had another good chance early in the third when Bergeron’s wrist shot from the slot deflected off Khudobin and slid just wide of the right post. Trailing 1-0, Boston tied it when Bergeron set up Pastrnak’s one-timer from the slot 5:11 into the opening period. The Bruins honored local military members, veterans and their families as part of Military Appreciation Night. Nine players each purchased $2,500 worth of tickets. … Red Sox owner John Henry, President Sam Kennedy and pitcher Joe Kelly were on the ice before the game when the trio brought out the World Series trophy. Kelly was part of the ceremonial puck drop. … The Bruins held Dallas to four shots on goal in the first, tying the fewest they’ve allowed in any period this season. … Dallas D Roman Polak played his 700th NHL game.